Crazy, underwater adventures of little, yellow sponge and his numerous friends living in the Bikini Bottom. 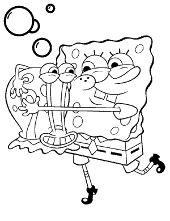 Now on the free and unique selection of SpongeBob coloring pages for children. Patrick Star, Squidward Tentacles, Mr. Krabs, Sandy Cheeks, Sheldon J. Plankton and of course the main character himself finally joined Topcoloringpages.net’s magic world. So follow the life of Bikini Bottom residents and you will learn how to keep optimism despite adverse circumstances. 1. What fruit is Sponge’s house? 3. What’s the name of the restaurant where the main character works? 5. Does Squidward Tentacles likes his neighbors? 6. What animal is Sandy Cheeks? Stephen Hillenburg, a creator of the whole series, is a trained marine biologist, so undoubtedly he knows a lot about life in the deep sea. Hillenburg came up with the idea that his main character will look like a kitchen sponge while doing dishes. The cartoon was screened in 136 countries and it gained millions of fans among children, teenagers, and even adults. It is also a record production of Nickelodeon in terms of the number of produced episodes (more than 200). In honor of SpongeBob his name was given to recently discovered species of fungi. Named Spongiforma squarepantsii. The scientist came up with the idea to give this name because fungi looks more like a sponge sea than a mushroom. Initially, the main character was to be named SpongeBoy. However, this name was already in use by the producer of mops. Eventually, the creator made up the very similar name and so it stayed until now. Many celebrities visited Bikini Bottom as guest roles. You could already see there Pink, Will Ferrell, Johnny Depp, and Robin Williams. The very first SpongeBob coloring pages appeared on a market in 1999. It’s hard to believe that they were popular among children for so many years. Welcome an absolutely unique selection of printable SpongeBob coloring pages with underwater adventures of a crazy sponge and his faithful friends from the Bikini Bottom. You will fin here clumsy Patrick Star, a bit grumpy Squidward Tentacles, resourceful Mr. Krabs, friendly Sandy, sleepy Gary the Snail and tiny Sheldon J. Plankton – we’ve got them all.